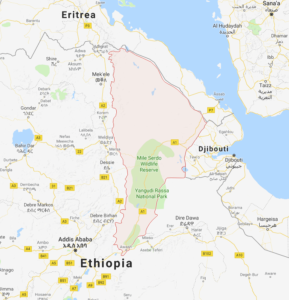 Eighteen people have been killed in the past two days of fighting between the Afar and Issa pastoral communities as Afari officials accused the government of Djibouti, special forces of the Somali region, the Issa and Gurgura Liberation Front as well as TPLF of igniting the conflict. Thousands have also been displaced in Gewane and Awash as a result of the conflict. Akadir Ibrahim, an Afari human rights activist told ESAT that there is a long history of dispute and at times clashes between the Afar and Issa clans but said the recent incident was a politically motivated plot by foreign actors and regional forces inside the country. The deadly violence was sparked when some groups replaced the flag of the Afar region with that of the Somali region in an Afari school. The Afar Revolutionary Democratic Unity Front (ARDUF) or Afar UGUUGUMO blamed the Somali Regional Special Forces and Issa armed groups of launching deadly attack against the Afaris. ESAT’s attempt to reach the Somali regional administration for a response has not been successful. The Afar and Issa people have historically been involved in deadly clashes over pastoral resources and turf war.